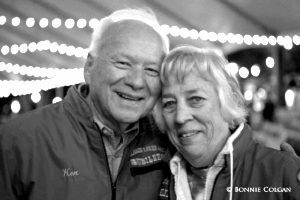 Long-time festival directors Flossie and Ken Coulter are enjoying the second year of their retirement as year-round residents of Lake Havasu City, Arizona. They are looking forward to only their second summer vacation in 28 years when they will hit the road in mid-June for a 10-week tour of the Western United States in their motor home. “Running the Mammoth Lakes Jazz Jubilee for 26 years, we never were able to get away during the summer,” Ken stated. They have joined a local RV club that takes short monthly trips (under 100 miles), and they did a tour of Yellowstone Park in 2015. They’ve also joined the Lake Havasu Yacht Club and spend time on their boat cruising Lake Havasu and the Colorado River. What Flossie and Ken and their jazzy cohorts accomplished over 26 years is truly amazing. Mammoth Lakes is a high-end resort community at an altitude of 7,880 feet in California’s Eastern Sierra Mountains. The town has a permanent population of 8,073 hardy souls who contend with an average of 206 inches of snow in the winter. Visitors are warned to be aware of deer straying onto the highway, especially at night. Yosemite National Park is a two-hour drive, and the nearest metropolitan city is Reno, Nevada, 164 miles to the north. What was unique about the festival is that there isn’t a permanent-standing performing arts center in town that seats more than a couple hundred people. So how did they create 10 venues that could accommodate 3,000 people a day who came to hear 30 bands over four-and-a-half days – and also do a bit of wine tasting? Their largest venue was “The Holler” carved out of a large wooded area, complete with wood chips on the ground and temporary seating for 1,200. “Big Top,” a large tent shared with other community groups held 700 seats along with the adjacent Edison Theater and its 200-seat auditorium. Among other venues used over the years were the base lodge of the Mammoth Mountain Ski Area, the community room of an RV park, an outdoor stage in a large shopping-dining complex, smaller tents in parking lots, and restaurants that turned their dining areas and lounges into temporary jazz settings. The Coulters were one of four couples who decided to “put on a little festival” back in 1989. That first festival lasted all of five hours and involved just two bands. Four hundred people each paid two dollars and had a great time. The next year, six bands were hired, and 1,000 people showed up. The main stage was poorly built and swayed when the musician played. With the lure of free beer, Flossie coerced a construction crew to abandon building a house nearby and got them to crawl under the stage during the second set to shore up the rickety stage with scrap lumber while the band on stage played on.